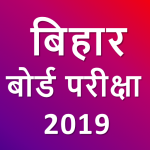 Download Admit Card, Time Table/ Date Sheet / Exam Schedule , Model Question Papers for Bihar Board ( BSEB ) Matric & Inter Exam 2019. Matric & Inter Results 2019 will be publish by BSEB in May /June 2019. 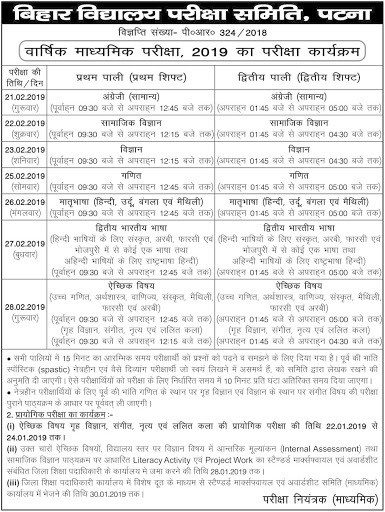 BSEB Matric / Class 10th exams will commence on February 21 and will continue till February 28, 2019 and Intermediate/ +2/ class 12th examinations is scheduled to be held from 6th Feb. to 16th Feb. 2019. Both examinations will be held in two shifts — first shift ( 9.30 am to 12.45 pm ), and the second shift ( 2:00 pm to 5.15 pm ). Practical Exams : January 15-25 2019 ( Home Center ). February 16 : Home Science (Arts), Economics (Commerce). Note : According to the time table notice, a “Cool off” time of additional 15 minutes has been given to the examines. The student has to use the “Cool off’ time for reading and analysis the questions and to plan the answers accordingly. The candidate is not supposed to write answer of any question during the “Cool off’ time. * Download Time Table / Date Sheet Matric & Intermediate 2019. * Download Model Question Paper. * Registration for Matric & Inter exam 2020. * New admission information / guidance (provided to more than 12,000 students last year) in all streams . * Notification will be send for exam updates. * Share this app via whatsapp, facebook, twitter etc. *** Download MATRIC & INTER Results 2018. 1. Registration for Matric & Inter Exam 2020 are going on, students who are in 9th class & class 11th they have to register for it. 2. Exam’s tips & tricks, result & admission updates send via phone call, notification, email or whatsapp. Disclaimer : this app or author or developer is not responsible for any type of mistake or changes or any circumstances which will unfavorable. 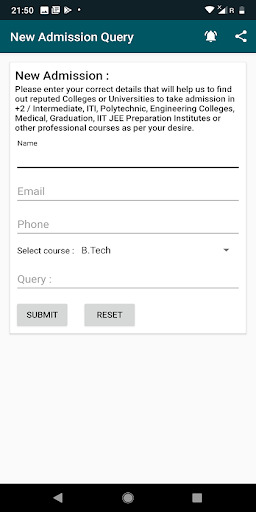 Please visit BSEB website for any query. 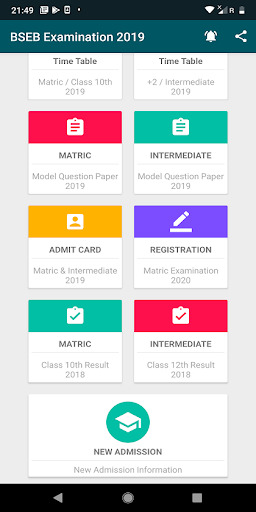 > Download Admit Card Matric & Inter 2019. 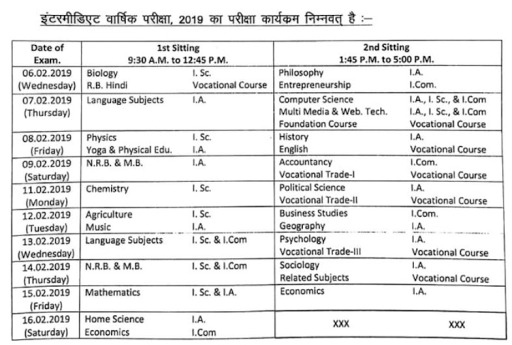 > Matric & Intermediate Date Sheet / Examination Schedule / Time Table 2019. 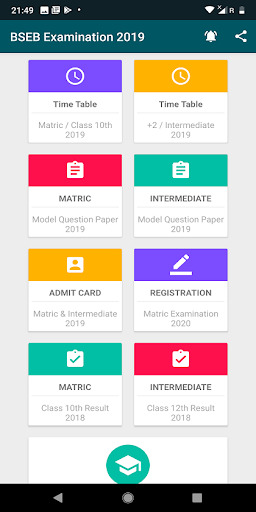 > Model Question Papers Matric & Intermediate 2019. > Previous Year Result Matric & Intermediate 2018. > Registration Matric & Inter for next session (2018-2019/2020). > New Admission Information (All Streams) for this session & next session.